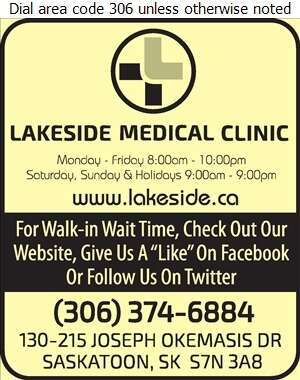 Lakeside Medical Clinic has been providing primary health care to residents of Saskatoon and surrounding areas since 1981. Along with regular scheduled patient appointments, the physicians at LMC provide walk-in services to patients requiring more urgent care and to patients who are unable to access their own physicians in a timely manner. Our walk in clinic is open 7 days a week with extended hours of operation.